Radio frequency contouring is officially the new beauty buzz on the beauty desk – and with good reason. Firming, tightening, plumping and refreshing, radio frequency helps skin to look more youthful, peachy, and let’s face it – more beautiful. No wonder it’s the perfect treatment to try pre-holiday to help with that all important bikini-body confidence. We put it to the test to find out more. Radio frequency body contouring (also known as skin tightening) is becoming all kinds of popular as it promises to tighten the skin and improve tone, without any pain or downtime at all. The treatment is offered by Nu Cosmetic clinic and involves third generation radio frequency technology to offer a non-invasive, pain-free body treatment to help reduce the appearance of cellulite, firm skin, boost collagen production and tackle any pesky fatty deposits that won’t budge with exercise. It’s a pretty versatile treatment as it can also help reduce flabby skin, tighten bingo wings, contour and tighten a post pregnancy tummy, reduce fine lines and wrinkles (on the face and body), reduce saddle bags and even lift and tighten your bum. What’s more radio frequency body contouring comes with the guarantee that you won’t need any recovery time. Essentially radio frequency treatments deliver an electrical current via electrodes to the skin, in order to heat the deeper and more superficial layers. As our skin matures, the collagen and elastin proteins which help support a tight skin structure start to break down. And as skin loses elasticity, fine lines, wrinkles and a dull or saggy appearance are never far away. The radio frequency energy penetrates the skin layers to selectively heat the skin tissue where the collagen fibres are embedded. The local heating causes an immediate contraction of the collagen fibres, and fat cells drain then shrink, while those all-important fibroblast cells (part of our connective tissue) are stimulated to produce new collagen and elastic fibres. 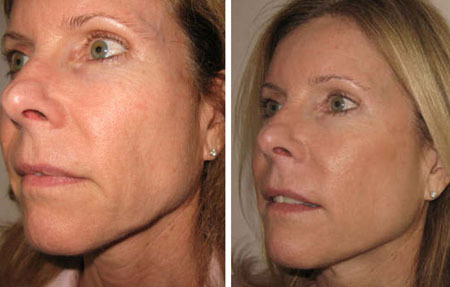 The effect of this is tighter, smoother, younger looking skin with a visible ‘lift’. Fat cells are reduced and stubborn cellulite looks a lot less noticeable. The treatment itself is surprisingly relaxing. Each area on your body is treated for 20-30 minutes. All that’s required is to show your therapist your problem areas (in this case a flabby tum and less than toned thighs) and lie back on the treatment bed and wait for the magic to begin. The therapist will apply a jelly lubricant to your skin to act as a protective barrier between you and the electrode rod which can get quite hot! Then it the electrode rod (which conveniently is shaped like a three-pronged massager) is rubbed over your skin, focusing on any pesky areas that need extra attention. The technique is so relaxing that actually it’s easy to fall fast asleep – always a sign of a good treatment. Most patients will be able to notice an immediate result in the tightness of their skin, but results continue to emerge in the days following the treatment too. Skin is remarkably smoother and muscle tone is more visible too. We have to say that we were very impressed. The treatment was as good as its word – pain free and results focused. For longer term results, one session isn’t enough. Normally, multiple sessions are required, generally 1-3 per week until you’ve had about 4-8 treatments in total, this depends on the results you want and the advice of your aesthetic practitioner. To maintain the effects try and lead a healthy lifestyle with a balanced diet and regular exercise otherwise that cellulite could just as easily come back. Normally there are no side effects from the treatment, but some people might find the treatment area is a little red post treatment but this usually resolves after 30 minutes – 24 hours post treatment. Rarely swelling or bruising may occur, but these effects usually settle within a few days. The cost of radio frequency can vary depending on the area of the body (from a 30 minute treatment upwards) and with results as remarkable as you’d hope – it’s money well-spent. Our verdict? A perfect pre-holiday treatment for ultimate body confidence! Say goodbye to wobble and hello to a taut new you! Find out more information by visiting www.nucosmeticclinic.co.uk or calling 0800 0 30 29 30.